The perfect fold away solution, these tables are portable lightweight and practical, Ideal for a mobile groomer or home grooming enthusiast. 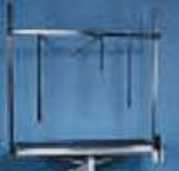 They have strong, durable stainless steel legs, non-slip rubber matting top and come complete with a removable, adjustable grooming arm and a clip on wire storage rack. Adjustable grooming arm and neck noose. Clip on wire storage rack. Adjusts from 24-35 Inches in height with the squeeze of the finger tabs. Heavy Duty Folding Grooming Arm with Clamp. Made in the USA by Champagne. 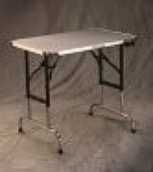 Ringside Folding Grooming Table - folds in the middle for easy carry and very portable. Exellent for small breeds at ringside or quick 'touch ups'. Size:18"/45.7cm wide X 23"/58.4cm long X 25"/63.5cm high. Weighs 15.lbs. Folding Ringside Grooming Table - folds in the middle for easy carry and very portable. Size: 18"/45.7cm wide X 23"/58.4cm long X 30"/76.2cm high. Weighs 15.lbs. Folding Ringside Grooming Table.Ffolds in the middle for easy carry and very portable. Exellent for small & Med small breeds at ringside or quick 'touch ups'. Size: 18"W x 30"L x 30"High. 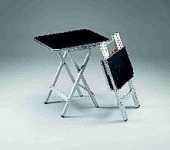 Light weight table that folds in the middle, adjustable feet that you can adjust on uneven ground or surfaces. Designed for small/medium toy dogs. This holding frame is sturdy and will give control to Small and Medium size Dogs and Cats. Resco 3/4" Nylon 17" Grooming Noose Suresnap Fastener. Resco 3/4" Nylon 22" Grooming Halter Suresnap Fastener. Colour: Black - 9 mm wide. Colour: Black - 16 mm wide. Show Tech Professional Grooming Noose Set. Medium Duty. 1 cm Wide. 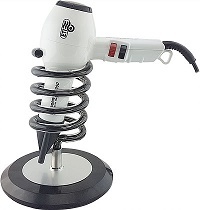 A stylish twizzle design holds most professional grade hairdryers. Twizzle shape is resillient and flexible, accomodating most hairdryer nozzle sizes. The black and silver base is weighted for balanced support of the dryer. All twizzles can be dissembled for space saving storage. Twizzle shape is resillient and flexible, accomodating most hairdryers nozzle sizes. The black and silver base is weighted for balanced support of the dryer. All twizzles can be dissembled for space saving storage. Dryer holder for hands free grooming.